Philadelphians can walk on water. Well, we can glide on it. Each year the Blue Cross RiverRink is rebuilt at Penn’s Landing on the Delaware River. But before we can show off our spins, jumps, and falls, the folks at Penn’s Landing have to freeze a parking lot full of ice, and keep it frozen under us. How do they do that?? With water.The staff builds a big wooden frame and fills it in with a layer of sand. This protects the parking lot, and evens out the bottom of the rink. Then, they lay down hundreds of tiny tubes, running back and forth, across the rink. The tubes are filled with water, and hooked up to a “chiller” which cools the water down to -9 degrees Celcius (15F) and pushes it through the tubes. Does something sound weird about that? It should! Shouldn’t the water in the tubes be frozen ice?? While ice on the roads or the rink may look like one big block, start thinking of it as billions of molecules. They’re always bumping around with heat, but as they get colder, they slow down and stick together. That’s how ice freezes; the molecules slow down enough to form a crystal, rather like putting LEGOs together. You have to slow them down to stick them together. 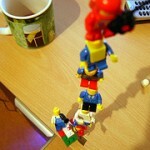 Imagine you built a tower out of LEGOs, and someone came by and switched a few LEGOs with K-NEX. What would happen to your tower? It would fall! Now imagine you traded more and more LEGOs for K-NEX. Eventually, you would have a K-NEX tower that would stand just fine! Salt + Ice = Cool! Has your driveway or sidewalk ever gotten too icy? How did you melt the ice? With salt! The salt bits get in between the water molecules, like K-NEX in between LEGOs, and break up the ice, turning it into salt-water. It seems funny, but they freeze the ice skating rink the same way you melt the ice on your driveway or sidewalk. Those tubes under the ice need to get really cold, without freezing inside. Try it! If your browser loads flash, click “add solute” below to mix salt into water. Check out how it breaks up the ice! Try lowering (or raising) the temperature by clicking on the number, and you can see how cold it can get before things start freezing again. This simulation comes from here, a great chemistry resource. At the Rink, we invited guests to add salt to ice water, and things got pretty cold! It hovered around -22 degrees Celcius! Putting your hand in the salted ice was a new experience for most of us - our hand went instantly, briefly numb from the cold! Some rinks add ordinary salt to the water in the tubes to keep them from freezing. 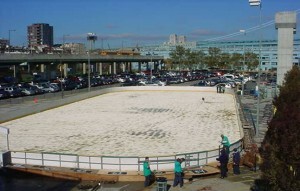 Most modern rinks, including the BlueCross RiverRink, now add Ethylene Glycol, the same antifreeze you put in your car! Neit her the rink nor your car uses pure antifreeze. You wouldn’t pour too much salt on your driveway, or you’d have a driveway full of solid salt. If you use pure antifreeze, it can actually freeze sooner, at a higher temperature. The rink uses 60% Anti-freeze and 40% water. Cars work best with 50% and 50% so that the liquid won’t boil in your hot engine either, look at this web-site for more info on cars. Since the liquid won’ t freeze easily, they can run it through a chiller, which works like a big air conditioner. 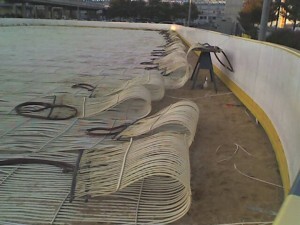 It can take more and more heat away from the liquid, cooling it off, and the tubes get cold enough to freeze the rink. They bring over a giant fire hose and start spraying water over the tubes. They let it freeze, and then spray more. And more. And more! They stop mid-way to paint a layer of ice white, and then spray even more water. Eventually, there’s a giant block of ice to skate on. Want to see some of this live? Ironically, on one of the hottest days of the year, Wondergy was asked to play with the science of Ice Skating to support the Philadelphia Flyers. So we brought this all together.